Hacked By Ahmed 01 » North Coast Biochar is Now Available! North Coast Biochar is Now Available! 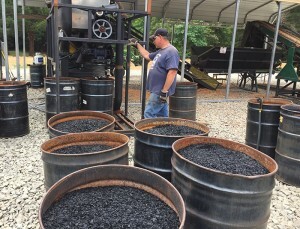 The Redwood Forest Foundation, Inc. (RFFI), a non-profit organization that owns and manages the FSC Certified Usal Forest on the Lost Coast of northern California, is now producing high-carbon, low-ash biochar from surplus tan oak culled during forest restoration activities. Production started on June 1, and this high-quality soil amendment is being marketed under the name North Coast Biochar. Sold in 1 or 1.5 cubic yard totes, this product is made using a Biochar Solutions pyrolysis unit that is specifically designed to make biochar at the middle heat range of 500 to 700 degrees C which is considered an ideal temperature range to maximize biochar’s adsorptive qualities. By purchasing this product you will be helping to support three non-profit organizations (RFFI, Sonoma Biochar Initiative, & Sonoma Ecology Center) working to promote sustainable agriculture and forestry practices. For more information, call Raymond Baltar at 707 291-3240.